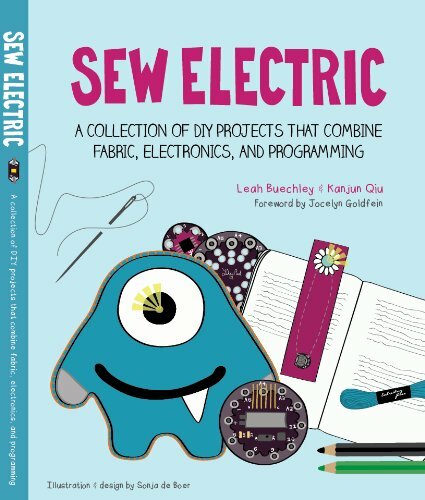 Leah Buechley, the creator of the LilyPad Arduino and my former advisor, recently published a great new book based on that platform, together with Kanjun Qiu and Sonja de Boer. Sew Electric is a collection of DIY e-textile projects that introduce electronics and programming through textile crafts. The projects include a sparkling bracelet, a singing monster, a light-up bookmark, and a fabric piano. Through these activities, readers are introduced to the fundamentals of electronics and programming as well as craft and design practices. The projects are beautifully illustrated and the instructions are clear and detailed. This is a wonderful resource for showing potential uses of electronics and the Arduino platform, specifically in ways that appeal to audiences not traditionally associated with these technologies. How was the idea of the book born and what’s its main aim? We want the book to get people excited about electronics and programming. We hope it will help people play, tinker, hack, and learn. There are very few engineering resources that are appealing to young women and girls. We wanted to create an electronics introduction that looks and feels different from anything else that’s out there. In terms of the history, my student Kanjun Qiu built a series of lovely LilyPad projects & wrote DIY tutorials for them for her master’s thesis. In collaboration with NCWIT (the National Center for Women and Information Technology), we tested the tutorials with kids and teachers and got lots of positive feedback. We decided to publish the series as a book and website to make them more visible and accessible. We’d like to connect to as many people as possible. How did you manage to design a book for adults but also good for kids? When I was a kid I found many of the toys and books designed especially for children to be terribly patronizing. Kids are smart, savvy, and skilled. For the book, we aimed to design projects that are fun and whimsical but also complex and challenging. We focused on using direct and straightforward, but never childish, language. We assume that our readers have no previous experience, but limitless ability. You’ve been working on the LilyPad Arduino for a number of years now. What have been the most interesting developments in that time? It’s been a delight to see what different people do with it! It’s been used in haute couture fashion, sculpture, dog shows, dance costumes, fabric robots…an enchanting collection of stuff. It’s also been fascinating to research and begin to understand who is using LilyPad. A study I did in 2010 found that while only about 2% of people who build Arduino projects are women, about 65% of LilyPad builders are female. A spectacular discrepancy! I think this shows that the Arduino community can benefit tremendously from tools that connect to different materials, communities, and creative traditions. What do you think are the broader goals and implications of the book and the LilyPad platform? 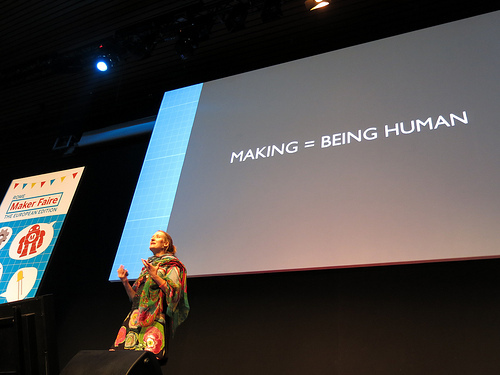 Bringing more diversity to the Arduino community and the larger technology community is a driving force. It’s disgraceful how few women & people of color participate in technology creation. But, our community can also benefit from more diversity in the materials it employs and the types of projects it works on. For instance, I’d love to see grandmothers building Arduino projects that involve gardens and food. Compared to when you started working on the LilyPad, it seems that are now many more electronics projects aimed at people without a technical background. What do you think about this trend? Wearable computing has been defined by many mainstream commenters as a big trend in which to invest in the next years. What’s your opinion on that? I’m skeptical about wearables hype. Wearables & e-textiles have many marvelous qualities. They give new expressive tools to fashion designers, industrial designers, and artists. They embody appealing juxtapositions–of male and female, soft and hard, new and old. And they’re fantastic vehicles for technological fantasies–bringing to mind the magic cloaks and carpets from fairy tales, the flashy costumes of comic book superheros, and countless scifi eutopias/distopias. But, companies that try to bring wearables, especially e-textiles, to market face significant hurdles. The manufacturing processes for the electronics and textile industries are very different and integration is extremely challenging. The timescales of the fashion and electronics worlds are out of sync–though we think of technology as fast moving, clothing styles change much faster, every couple of months. Moreover, for a range of environmental and engineering reasons, it doesn’t make sense to embed electronics into most everyday items of clothing. Do we want chips and batteries in every t-shirt? There have been some modest successes (blinky sneakers, heated winter wear, and body-sensing sports apparell), but the most compelling e-textiles work has taken place on smaller scales in the art and design worlds. E-textiles hold more promise as a creative artistic medium than as a vehicle for mass produced products. At the moment, I’m especially interested in large scale architectural work. My partner and I are designing and building a home and studio and I’m working on interactive mural projects. It’s wonderful to be soldering, programming, sewing, and painting again!